DETROIT - A suburban Detroit man who shot an unarmed woman on his porch could come face-to-face with her parents today as he receives his sentence for second-degree murder. Theodore Wafer, 55, is scheduled to return to court Wednesday. 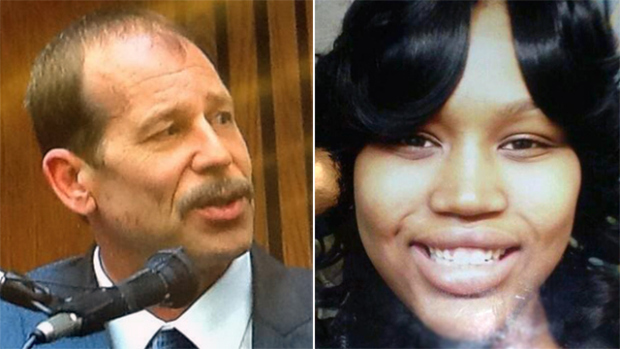 Renisha McBride's family will have an opportunity to make a statement before the judge orders a punishment. CBS Detroit reports that Wafer is also expected to make a statement, addressing the 19-year-old McBride's family directly. His attorneys hope the judge will take his apology into consideration and not sentence the Dearborn Heights man to life in prison. Wafer never denied shooting McBride in the face when she showed up drunk on his porch last November, according to the station. He testified that he shot the victim in self-defense after she pounded on his door and allegedly attempted to break into his home. The station reports McBride had an extremely high blood-alcohol level at the time of the incident. She was shot three hours after walking away from a car crash in Detroit, roughly a half-mile away from Wafer's home. Prosecutors are recommending at least 17 years in prison for Wafer, including two years for unlawful use of a gun. Wafer said he shot McBride because he feared for his life, but a jury rejected his claim of self-defense. Defense attorney Cheryl Carpenter is asking for as few as six years in prison. She says the shooting was an isolated incident and that it haunts Wafer.